BATH – Defending Michigan Amateur Champion Ryan Johnson of New Boston thinks Eagle Eye Golf Club is a perfect venue to host the 105th edition of the state championship starting Tuesday and continuing through Saturday. No. 17 is a 146-yard par 3 that course designer Chris Lutzke, a protégé of Pete Dye, designed as a replica of the famous Dye-designed island hole 17th at TPC Sawgrass in Ponte Vedra, Fla.
Dye’s testy par 3 has beguiled the best golfers in the world, and the replica at Eagle Eye has the same effect on golfers, even great competitive golfers when the heat is on. 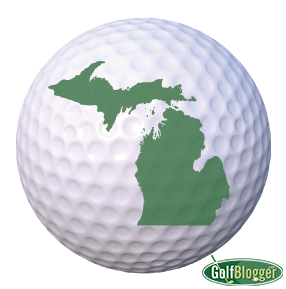 Ken Hartmann, senior director of rules and competitions for the Golf Association of Michigan, said Eagle Eye presents many challenges for the field in its maximum 7,300 yards. Hartmann said the classic No. 17 hole will impact the tournament. The Amateur has been missed by Lansing for 82 years. The championship has been played in Lansing’s metro area just once – 1934 at Country Club of Lansing. Michigan golf legend Chuck Kocsis won his second of a record six Amateur titles that year. Eagle Eye has developed some tournament history quickly hosting multiple Michigan PGA Championships, U.S. Open qualifiers and other GAM championships. In preparation for hosting the Michigan Amateur, and in answer to feedback from golfers, some renovation work was completed by Lutzke, the original architect, last fall on holes 3 and 15. No. 3, a short par 4 with a large hill taking up much of the last 100 yards before the green, has a little less hill. Two saddle shaped areas were trimmed from the hill to open up some sight lines to the green from the fairway, eliminate some of the blind shot aspect and the forcing of players to walk up the hill to calculate their shots to the green. The 15th hole, another short par 4, features an elevated green perched atop a small hill. Over time it was clear many golfers were missing the green at different shot angles, yet the ball would trickle off the green and down the hill to the almost the same spot. Lutzke removed bunkers and built a more substantial landing area and general slope off the front of the green. The field should be up to the challenges of Eagle Eye. It will feature 162 of Michigan’s best amateur golfers pared down from 848 entrants through local qualifying. Six past champions, including Johnson, are in the field. They are 2014 champion Henry Do of Canton, 2013 champion Andrew Chapman of Traverse City, 2006 champion Greg Davies of West Bloomfield, 2001 champion Andy Matthews of Ada and 1992 and ’99 champion Randy Lewis of Alma. Tom Werkmeister, the 2009 champion and exempt, withdrew from the field. Matthews is a reinstated amateur after several years as a touring professional. Other top players in the field include last year’s runner-up Kory Roberts of Battle Creek, Evan Bowser of Dearborn, who won the Horton Smith Invitational and the Michigan Publinx Medal Play Championship in recent weeks, and last year’s GAM champion Mitchell White of Muskegon.